I’ve seen enough business case proposals and implementations of SD-WAN to be able to put a stake in the ground that SD-WAN can cut WAN costs in half. 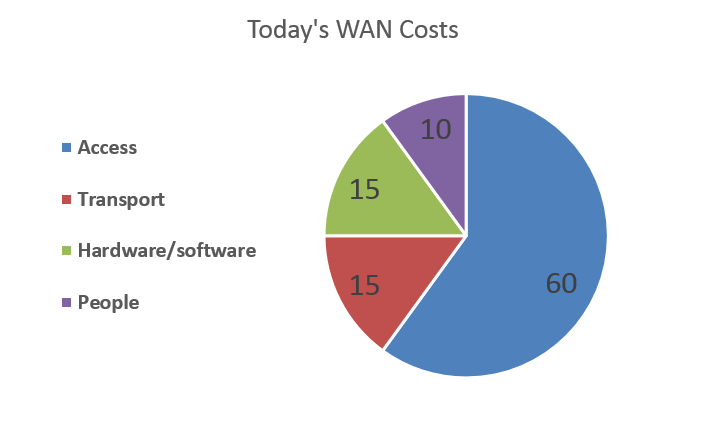 Typically, WAN costs are about 10% of an enterprise’s overall IT budget. Anytime a project can save money, improve performance, increase reliability, and provide additional security controls, it would seem that it would be a slam dunk. But just like with SIP trunking 10 years ago, there are many folks who are still reluctant to believe the magnitude of the opportunity with SD-WAN. If you talk to sourcing managers, some of them just think that issuing an RFP for traditional WAN services will save 25% and that the implementation costs to move to SD-WAN do not outweigh the risks and effort. If you talk with network engineers, they tend to see the SD-WAN opportunity only for small sites where broadband Internet can deliver enough bandwidth and replace T1/MPLS. Many do not see large sites that require greater than 500Mbps as appropriate targets for SD-WAN. 1) Buy Wholesale Access and Be NSP Independent – No one network service provider has complete coverage. Access, whether fiber or copper, is 60% of WAN costs. Network, fiber, and Internet service providers sell access to others at wholesale rates that are significantly less than heavily discounted retail rates. Earthlink (now Windstream), Global Capacity (now GTT), and Mettel are examples of Virtual Network Operators (VNOs) that buy wholesale network access and can turn around and provide an enterprise a single entity to work with for ordering, installing, support, and billing. Large enterprises can buy wholesale bandwidth at large carrier-neutral colocation providers like Equinix, CoreSite, and Cologix, including wholesale access to large cloud providers (IaaS, SaaS, UC/CCaaS). This is a model wherein an enterprise goes to the ~1,000 fiber networks versus bringing in one or two network service providers. 2) Be Transport Service Agnostic – SD-WAN software provides an overlay for routing and segmentation that allows for any-to-any connectivity over a bunch of different transport types; Ethernet Private Line (EPL), VPLS, MPLS, Internet, LTE, satellite, and fixed wireless/5G are all options depending on the size and reliability requirements at a site. Most applications that run the business are lower bandwidth transactions. High-bandwidth applications are those that are used to manage the business -- typically the collaboration applications. I have seen retail stores run on LTE or satellite after a fiber-seeking backhoe has cut the primary link. Also, for high-bandwidth sites, EPL is typically 25% less expensive than MPLS. 3) Commodity Hardware & Software – Thanks to Intel DPDK and AES-NI as well as initiatives from the opensource community such as FD.io, the cost of WAN hardware and software is a fraction of what it use to be. In the branch office, the router and security software can run on the same hardware as the print server and other services. The need to have specific hardware just for WAN routing has gone away. This concept is hard for many enterprises organizationally because of the divide between who owns/manages the hardware versus the services. Giving the network team the ability to own and manage the hardware is one reason why 90% of early SD-WAN implementations are on appliances. Many of the new SD-WAN vendors have the foundation of their software with opensource components and have pricing and business models that are 75% less than the traditional router. Same goes with support costs. 4) Automation – Zero touch provisioning and automating network changes helps reduce the number of people required to install, manage, and support a WAN. One thing that most SD-WAN platforms do well is enable dynamic traffic routing over the best path, and when congestion or outages occur, traffic is automatically routed to a better path. Cloud providers use the above principals to build their SD-WANs. Enterprises should take a page from the cloud providers’ book and follow suit in getting faster, better, cheaper, and more secure solutions versus having to make a trade-off. The days of buying technology and services from just a few well-established vendors are coming to an end. SIP trunking uptake was initially slow since there were not turnkey solutions and companies had to add a new SBC vendor, and carriers offering the biggest savings were the tier 2 & 3 carriers. The SD-WAN market is similar today, the biggest savings is not coming from the well established vendors, yet.